What ever you want to call it, it's the grand daddy of the RPM movement and its 25 years old this year. 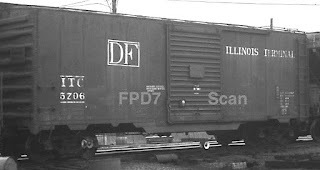 In honour of this milestone, Yarmouth Model Works has decided upon a resin freight car model to mark the occasion. ITC's ACF built postwar 40' boxcar. There were only 10 of these built for the railroad, but we feel that this is an appropriate car for the occasion. The locale is certainly right! The kit will feature all the things you've come to expect from Yarmouth Model Works, etchings, one piece body, custom decals, and Kato trucks. The kit will retail for $60.00 USD and will be available at the RPM first and then online. So it would seem that at some point, maybe a year or more ago, something changed in the "Blogger" software I use for this blog. I was no longer getting notification of comments waiting to be approved for publishing on the blog. Today while poking around trying to solve another problem I found all the comments, and have only just now "approved" them all and they are up on the blog now. So I'm sorry if you felt ignored or otherwise slighted. Just me being ignorant of the nuances of the software. Here's a few of the new kits I hope to release at the Chicagoland RPM in Oct.
And maybe a few other treasures as well! At least what will be Friant, circa 1951. End of the line for the Clovis branch. Here will be located a turntable, water tank, large station, significant stock pens and the weigh scale. All the stone that gets hauled out of the Rockfield quarry is brought here and weighed before heading back to Fresno. Of course the locomotives will get a big drink and then turned, before heading south and west again. The turntable will be located about where the level is sitting in the photo, with the stock pens and then the station as you get closer to the camera. I like to fill the joints in the Homasote with drywall mud as well as covering the joints with mesh tape. Keeps things from opening up with humidity and temperature changes. Once that is all dry a coat of paint then I can layout the track arrangement and get on with track laying. And speaking of humidity, today is arguably one of the most humid days we've had this year, not terribly hot, but man is it wet! And this is the day I choose to wrestle sheets of Homasote through the table saw. I do wonder about myself at times! The 3 vinegar tank cars, each with a different level of weathering. I find silver paint jobs the trickiest to weather. Maybe that's just me. I started with a wash of black ink diluted heavily in alcohol. That helped pick out the boards in the tanks and highlight the bolts, etc. I set the one on the left aside at that point. Then the other 2 were washed with a MiG product, a grey enamel wash which helped add the a level of overall dirt to everything and further highlight the tanks. Then the middle car was set aside. The 3rd car was given another very heavy wash of the grey enamel, making sure to build up colour around the tank bands and straps. Once that had dried, all 3 were oversprayed with suggestions of dust and road grime, the underframes were given a good coat of oil crude and road dirt. All in all, I'm pleased. Now to check with the client! In 1937 SP starting converting B-50-6/9 boxcars into cabooses, by cutting in windows in the sides, adding man doors in the ends and sliding the side door open about 3', nailing it in place and adding a man door. Over 100 cabooses were created this way, with variations in window styles. The cars rode on the original freight trucks, no leaf springs. They must of been a shear delight to ride in. At least a stove was provided for the coffee pot and for heating the beans! My friend Trevor Marshall sold me this kit along with the locomotives and a few other treasures when I made the leap into SP, and we're both enthralled by this car. Even though there is a very nice laser cut caboose kit on the market for SP cabooses, I had to have one of these, just cause it's neat. The kit build is straight forward and I weathered it rather heavily, since cabooses don't get a lot of respect. The SP and subsidiaries had 7200 of these cars built for them in 1924. The Sunshine Models kit does a lovely job of recreating these unique cars, right down to the neat etched ladders. I did replace the sill steps with etched ones from my own line as well as laser cut running boards, mostly so I didn't have to deflash the resin cast ones. To my eye I've found that Scalecoat boxcar Red II to be a good choice for the SP car colour. The weathering was a fun departure for me. I've been working with enamel washes from AK Interactive for a few different effects and the weathering on these cars shows some of that experimentation. I dampen the surface with enamel thinner, then dab some of the AK colour onto the damp surface. The colour wicks along edges and flows into cracks and grooves, a little cleanup with a flat brush to get rid of the obvious blotches and we let that dry. The process takes time as each surface needs to dry before moving onto then other side and the paint needs to be fully cured so that the enamel thinner doesn't lift the colour layer(ask me how I know). A little overspray for dust and we ready to go. I'll be demonstrating this technique next time I get into the Trainmasters TV studio. Just applied flat finish to these 3. The famous, or infamous, Sunshine Models Vinegar tank car. Each one of these will get weathered to a different level, suggesting different ages of tanks. Still working out how I want to proceed with that task. Silver is a tricky colour to weather. I have a few ideas gestating. As the title states it is indeed more than 12 of these kits I've now assembled. While there is a lot of parts to play with, my decision years ago to have steel tubes milled to a specific size for a core for the tank, was a sanity saver. It gives the car weight and a true round surface to affix the wrapper to. From there it's a simple matter, (while somewhat prolonged process) of fitting the tank to the frame and it's supports. The one piece frame saves the assembly process from being a true nightmare. Once the flat finish cures I'll start flinging the dirt. When my modeling passions come together. Or is that trains and tanks? Doesn't matter. After 3 years of on and off effort this little project is done. Sort of. 1/35th scale German 86 class loco(my fav German loco btw), one heavy duty 6 axle flat and the feared JagdPanther all in one package. I got to play around with new weathering techniques and products while weathering the JagdPanther. Various enamel washes and streaking effects. Powder pigments on the tracks. All of which have been carried over into my own railroad modeling finishes. I expect that I'll lend this to the LHS for his window for awhile as soon as we get his window display cleaned up. Back to the 1/87 trains.